It dropped everything but the horror and devolved into a Buffy clone. Everything unique about the tone and setting got sidelined to focus on the macabre, horrific elements. And, for what it’s worth, it wasn’t a bad facsimile of Buffy’s later seasons. There were some fun moments and cool visuals, and some of the characters were neat. But it abandoned its niche to become virtually indistinguishable from other shows in its genre. Pity. Sorry – let’s get back to the Christmas episode. Only, technically, this is less a Christmas episode than a Solstice episode, since the Satanic witches celebrate that instead. Most of the episode plays out over the Solstice, rather than Christmas, and it plays with the notion of the longest night of the year. A Midwinter’s Tale comes equipped with a couple plots that really needed a full episode to develop, in addition to several B-plots that were probably more significant to the series’ overall direction. The bulk of the episode is devoted to Sabrina’s attempts to conjure her mother’s spirit, coupled with the after-effects of Madame Satan’s (I hate that name so much) interference. In order to prevent Sabrina from interacting with her mom, Madame Satan (seriously: a little part of me dies every time I type that name) uses a spell to quench the Spellmans’ Yule log and invite a family of mischievous spirits into their house. The spirits who show up are the children of Gryla, here reimagined as a somewhat cruel guardian of children’s spirits, rather than the child-eating giant from Icelandic myth. They almost murder the baby Zelda abducted in the last episode and attack other members of the family. In order to get rid of them, the Spellmans summon Gryla. At first, Gryla agrees to help, but when she discovers the baby they’re hiding, she wants to claim it for her own. Fortunately, Sabrina’s mother’s ghost appears and helps them trick Gryla, who winds up leaving with an enchanted stuffed bear. While all of that’s going on, Sabrina’s friend Susie has a job as a mall elf. Her boss, a stern old man playing Santa, abducts her and takes her to his basement, where he plans to dip her in wax and steal her soul, as he’s done with countless other children over the years. Susie is captured for a whole day, but Sabrina doesn’t find out about that until the last minute, when her other friend, Roz, shows up and tells her. Roz knows who took Susie, because she has the Shining the Cunning, a mysterious psychic power that gives her visions related to the plot. The Spellmans locate the demon and briefly entertain the idea of battling it, but then they just summon Gryla back instead. Despite the fact they just conned her out of a child, they know Gryla will be more interested in taking out a demon who preys on children. And... she does that. The episode's basically out of time, so Gryla basically shows up, captures the demon, and frees Susie in a minute or two. Then she dips the demon in wax, frees the spirits he's trapped, and adopts them. And that's about it. Except for the C-plot, continuing Sabrina's troubled relationship with her now-ex-boyfriend Harvey, who's still upset about his brother getting murdered by a pair of sadistic witches, resurrected by Sabrina, and then getting shot by Harvey (he came back evil). Sabrina tries to mend their relationship with a few magic gifts, but Harvey politely tells her he doesn't want magic in his life anymore. No one brings up or acknowledges that Sabrina was hanging out with the witches who murdered his brother (they even helped her summon her mom's spirit). I suspect the writers would prefer we forgot about that storyline. I think that's it for major story stuff. 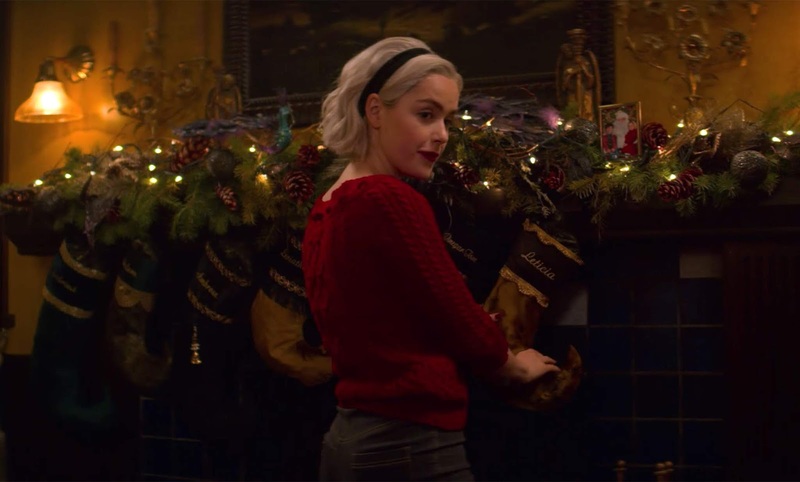 We get a little more stuff with Sabrina's mom's ghost (unless that's actually Madame Satan pretending to be her mom's ghost - I doubt the showrunners have decided, to be honest), a short bit with Ambrose going to a party, and a little more with Madame Satan, including a weird shot of three demons coming out of Hell or something. So. How was it? It was... fine. Probably one of the better episodes, but take that back-handed compliment as it's intended. The comedy and horror are solid, and it works well enough, despite some extremely awkward structuring and the sidelining of Susie's plot. I don't think it's a stretch to assume they had two pitches for holiday episodes and wound up trying to do both simultaneously. I like that it's a Solstice episode rather than Christmas, and I like that they take the folkloric horror of the yuletide season seriously. The holidays have a long tradition tied to horror, and it's no accident they're scheduled around the longest night of the year. That said, this has the same problems the series has: it's allowing itself to become just another genre comedy/horror/drama. It really needs to establish its own identity if it wants to be more than that.